Sleeps up to 8 in beds, Blackhawk on the River, away from it all. Welcome to Black Hawk on the River, a quiet community nestled against the Payette River and just 10 minutes from the heart of McCall, Idaho. This is where your next mountain retreat is awaiting you. The Bungalow at Black Hawk on the River offers guests a serene retreat with views of the pond and surrounding mountains, a gourmet kitchen, and the amenities of the beautiful River Lodge*. The rustic beauty of The Bungalow at Blackhawk is sure to fit the needs of anyone who stays. This family and pet friendly home offers 3 bedrooms, 3.5 baths plus an office/den that can serve as an additional bedroom with a pull out sofa bed and french doors for privacy. The Bungalow sleeps 8 in beds, but can accommodate up to 10. The main floor of the Bungalow at Blackhawk offers a very relaxing living room with large windows to enjoy the scenic view, a big screen TV, DVD player, and Amazon Fire TV (no cable). Off the living room is the Master suite, with a king bed a large bathroom with separate shower and soaker tub. The main floor also offers a gourmet kitchen with all the essentials you will need for meals at home with a kitchen table that seats 7. Across from the kitchen is the office/den which provides a great space for the kids to play, as well as a convertible sofa bed. The mud/laundry room is off the kitchen and is a great space to store and dry all your outdoor gear for the next days adventures. Upstairs is a second queen suite with attached bathroom and the third bedroom with two twin beds, lots of floor space and attached bathroom with separate shower and tub- the perfect space for the kids. 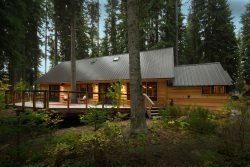 The Bungalow at Blackhawk offers the perfect retreat for anyone who wants to get away from the hustle and bustle of the city! Step outside the door and access hiking, biking, cross country, and snow shoeing trails. Just across West Mountain Road access the more than 500 miles of snow mobile trails, with out having to trailer your snow mobiles. The Bungalow at Blackhawk provides plenty of parking for your trucks, cars and trailers. If it's downhill skiing you are after, you're midway between Tamarack Resort and Brundage Mountain Resort. All guests must pay a $160 fee and must have waivers signed and turned in before arrival. ****This house sleeps 8 in beds, but can sleep up to 10 on floors and couches, we do not provide air mattresses or sleeping bags at this home. *River Lodge is only for use for $160 and must be paid before checkin and must notify MVR to let them know you want access. *****This house sleeps 8 in beds, but can sleep up to 12 on floors and couches, we do not provide air mattresses or sleeping bags at this home. ***This house sleeps 8 in beds, but can sleep up to 10 on floors and couches, we do not provide air mattresses or sleeping bags at this home. ***Sorry no access to garage.